The white supremacist suspected of murdering two men and wounding another screamed and shouted his way through an arraignment hearing Tuesday. Authorities say he faces several charges, including two counts of aggravated murder, attempted murder, two counts of second-degree intimidation and being a felon in possession of a restricted weapon. Christian is accused of killing fellow commuters Taliesin Namkai-Meche and Rick Best and stabbing Fletcher in the neck during a racist tirade on Portland’s MAX train. According to court documents, Christian was drinking purple sangria (because ... irony) and shouting, “Go home. We need American here,” “I don’t care if you are ISIS” and “Free speech or die,” among other things. Passengers tried to get him to calm down, but the Jesus of NaziMeth lookalike pulled out a folding knife and attacked the victims, USA Today reports. If you made a bunch of stereotypical, racist assumptions about a white nationalist who went on a stabbing spree after drinking purple drank on the train, well—you’d probably be right. Christian lived with his mother, dropped out of high school and spent time in jail for robbing a convenience store because “the guy there doesn’t sell any winning lottery tickets,” Christian confessed. 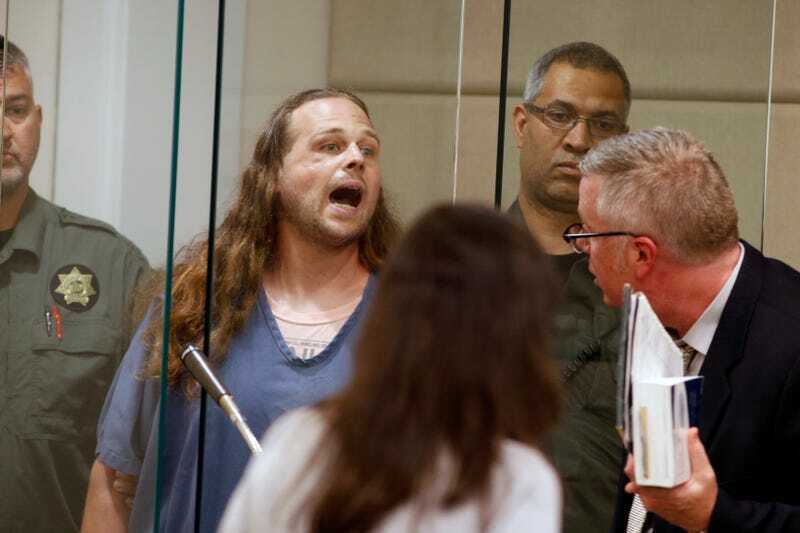 Make no mistake about it: Christian did not go crazy during his arraignment hearing or on that MAX train—Christian is crazy, because all white nationalists and neo-Nazis are mentally unstable by definition. Christian, like many of his ilk, has constructed an insane line of reasoning in his brain that makes him believe that an uneducated, homeless felon drinking Kool-Aid and tequila on public transportation is a superior human being simply because he is white. That’s what white supremacy is: desperation. It is a futile attempt at relevancy. It is knowing that they don’t have a redeeming quality in their pitiful bags of meat and bones, so they invent one out of thin air. Thinking that whiteness is better than anything else is no different from believing in unicorns, dragons or the Cleveland Browns going to the Super Bowl. God bless Christian and all white nationalists’ pathetic little souls. On second thought, God, maybe not.